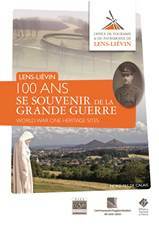 Brochure "100 ans - Se souvenir de la Grande Guerre à Lens-Liévin"
Télécharger la brochure "100 ans - Se souvenir de la Grande Guerre à Lens-Liévin"
Responding to growing demand from visitors wishing to explore the World War One Heritage Sites, the Tourist Information Center a publishes a new guide on this topic. It presents the major projects in the Centenary of the First World War (International Memorial Notre Dame de Lorette and Interpretive Centre Souchez), the main sites of memory Artois hills, but also other cemeteries and memorials reflecting the diversity of these places of memory, so many in our area. You will also find 3 museums territory working every day to the duty of memory. The paper pays tribute to the artists who came to fight in the sector as well as heroes and heroines of the Great War. Finally he recalls modes visits these sites and presents a selection of events in the territory of Lens-Lievin to the Centenary of the Great War.